The only other thing I knew I needed to get my hands on was this Rice Water Bright Light Cleansing Oil (17$), because I love me some oil and I kept hearing about this particular one. As mentioned in my latest monthly favorites, I love how it removes ALL my makeup, smells awesome, and makes my skin look brighter. In fact, I loved it so much that I ordered the Rice Water Bright Cleansing Foam(13$) on Amazon (it was cheaper and easier this way) to use as my morning cleanser. It has this really thick creamy texture that foams up super easily. A little goes a REALLY long way. So far so good, but I do find it a TAD drying, as in I get a bit of that "tight" feeling after (maybe I'm using too much, but it's hard to squeeze out less than I do). Nothing a good moisturizer can't fix but as the weather cools, I might need to look into another formula (they have a whole array in the "Rice Water" collection). Rice water has just been really amazing for my skin! It is known to be "moisturising, [an] antioxidant, and [to have] healing properties that help to improve circulation. [It also helps] prevent or fade age related spots, and ease inflammation to give you healthy, better moisturised and clear skin." BOOM! That's just form one article, but I read up a ton on it and I'm looking forward to test more things out with this ingredient! You are meant to keep these on for 30-40 minutes. Most patches you take off after 20 minutes, and I can't take them off soon enough! haha I was a bit annoyed. However, I must say they are way more comfortable than other patches I've tried (they have this thick "gelly" texture). It's not super apparent on picture but they do really help de-puff, smooth and hydrate and brighten a tad. Lastly, I decided to pick up the Pore Tightening Cover Cream(17$). I can't really say much about it yet. It has a really strong perfumy scent that might turn off some people or scare you guys with sensitive skin...But nothing dramatic happened when I tried it out. It has this nice silky "waxy" texture, reminiscent of the Benefit POREfessionnal, but it leaves a silkier finish, as in things might slip off... It really does diminish the appearance of pores but I don't really know if it helps with oil control as much as some of my other primers. I need to test it out more extensively but I forget to reach for it...oopsy! Will keep you posted! I was prepared to buy the whole store so I left after collecting this loot to avoid bankruptcy! 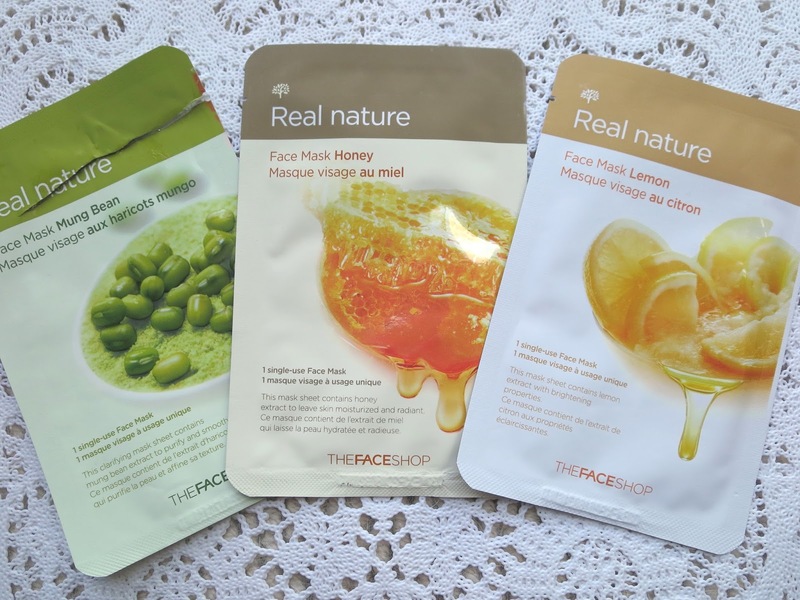 What are some of your favorite products from The FaceShop?